Let’s cut to the chase: Pan, by itself, is a disappointment, an uneven children’s fantasy movie that is disjointed, awkwardly humorous, suffers from production overkill, and makes very little sense throughout. But unfortunately, Pan isn’t just a movie by itself, it’s an origin story for a beloved children’s tale that didn’t need it in the first place. In recent years, Hollywood has given us origin story after origin story in an attempt to expand franchises and add “depth” to existing stories. Last year we had Maleficent, a movie that tried to rewrite the Sleeping Beauty story to make its Wicked Queen a more sympathetic character, as if somebody somewhere had decided that a Wicked Queen couldn’t just be a Wicked Queen; no, there had to be a good reason why she was a Wicked Queen. And now we get to see how a foundling called Peter became the high-flying leader of the Lost Boys, Peter Pan. But did we need to? Perhaps there’s a clue in the fact that J.M. Barrie, who created Peter Pan, never felt the need to go back and provide an origin story for him. And if he didn’t feel the need to, do we really need to know either? But Hollywood knows better (or so they like to think), and now we have an origin story anyway, but one that’s been given so little thought it’s frightening given all the talent involved in making it. You only have to watch the first five minutes of Pan to know that the makers have got it completely, spectacularly wrong. The scene is London, between the two World Wars. An unidentified young woman, clearly scared and frightened that she’s being followed, carries an infant with her until she reaches the doorstep of the Lambert Home for Boys. There she leaves him but not before she’s told him that they’ll meet again, in this world or another. Already there’s a problem: why does the woman abandon her son so recklessly (it’s not the most pleasant-looking of orphanages) and if he’s in as much danger as she seems to think, why take the risk of leaving him in such an awful place? Once in Neverland, the movie takes a left turn by introducing Blackbeard and his merry band of pirates, and what looks like thousands of Lost Boys, as they indulge in a bit of a sing-song. The song in question turns out to be Nirvana’s Smells Like Teen Spirit, an anachronistic choice that serves only to remind viewers just how well this sort of thing was done in A Knight’s Tale (2001) (and begs the question, does Blackbeard time travel as well for his Lost Boys?). From then on, and despite the introduction of James Hook (Hedlund) (also trapped by Blackbeard), and Tiger Lily (Mara), the princess of the natives, and a plot involving Blackbeard’s determined efforts to wipe out all the fairies (don’t ask why – the movie doesn’t), Pan becomes the Hugh Jackman larger-than-life performance movie as he struts and rampages and roars his way through things with all the gusto of a pantomime villain. It’s not a bad performance per se, it’s just in the wrong movie. As you’d expect, Neverland is beautifully, stunningly realised, and is a triumph of art direction, set construction, costume design, and special effects, but ultimately it all makes for a hollow confection, an empty shell that the narrative flits and jumps around without any clear idea of where it’s going or why. With the fairies hidden from Blackbeard’s grasp, and of course with Peter as his unwitting accomplice in getting to them, it comes as no surprise that the script shows the fairies completely able to defend themselves from Blackbeard and his men, thus ending any idea that the pirate’s intentions were in any way a threat. It’s not the first time in the movie that the viewer is likely to be wondering why something is happening, or if it’s likely to be explained (usually not). 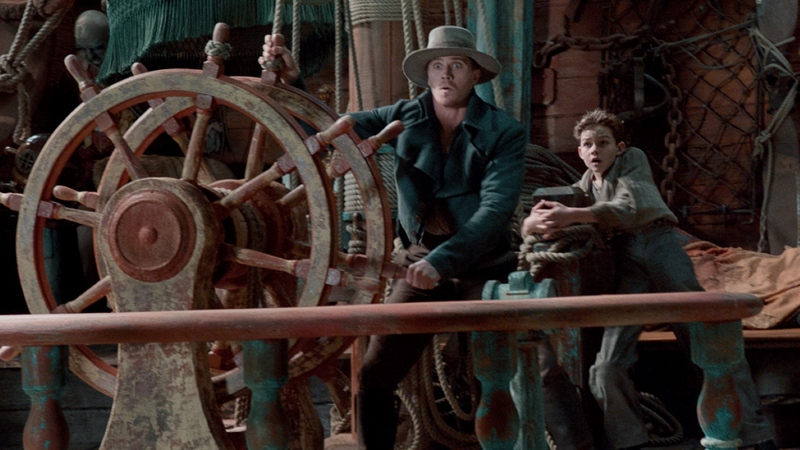 Pan is a movie that should be included in the ever-growing number of movies that come under the heading, Just Because You Can, Doesn’t Mean You Should. Joe Wright’s direction is focused largely on the cast, and while he’s obviously let Jackman do his own thing, he does allow Mara to give a decent performance, and Miller is suitably stout-hearted as Peter, even if he does take everything in his stride a little too easily. And Hedlund acts more by smiling roguishly than actually emoting, but it’s still a likeable portrayal. The only trouble is, Hook is a character who lacks for development, and remains the same from beginning to end. 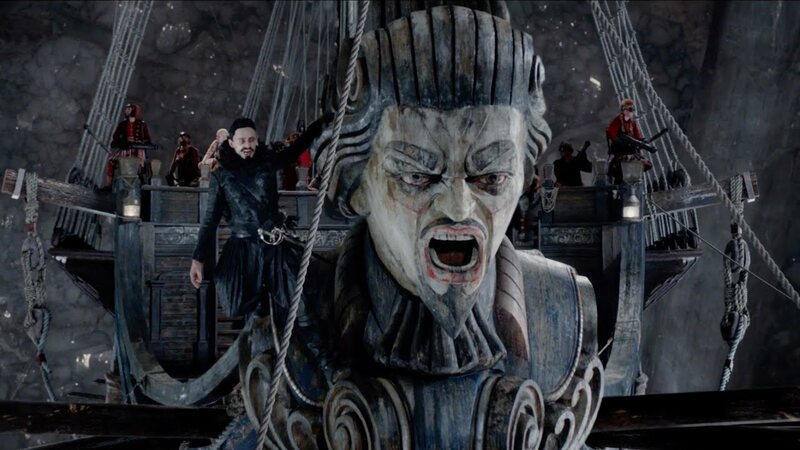 Pan‘s terrible performance at the box office – so far it’s only grossed $125m against a budget of $150m – will hopefully discourage other studios/production companies from messing with other established, classic stories. These stories are so well-regarded for a reason: they work independently of any others and in many cases are archetypal and don’t need further embellishment or expansion. Such is the case with Barrie’s tale of the boy who never grew up, and Pan serves only to reinforce what a foolhardy idea it is to try. 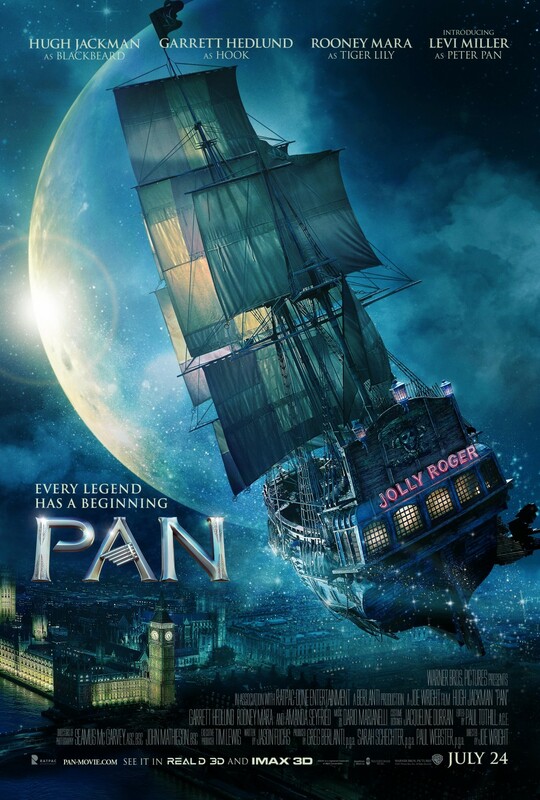 Rating: 4/10 – lacking a true sense of childlike wonder, or focus in the story it’s telling, Pan is the movie equivalent of pudding: rich, stolid, and if you’ve had too much, weighing too heavily for comfort; another unsatisfactory, unnecessary origin story that shows just how difficult it is to get these things right, and especially when there’s no real need to.